2015’s North Indian Ocean cyclone season has finally kicked off with the formation of a significant low pressure in the Arabian Sea. The presence of this low pressure also gave momentum to the stranded southwest monsoon and led to its arrival in Kerala on June 5. This low pressure is none other than tropical storm ASHOBAA. It was named by Sri Lanka. 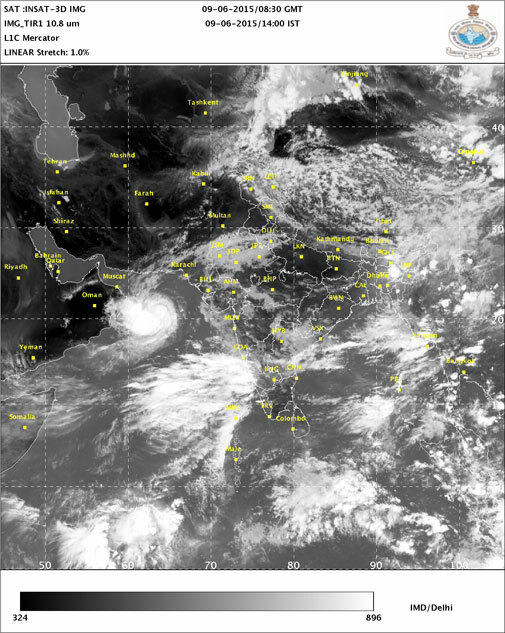 On the morning of June 9, Tuesday, ASHOBAA was located near 20°N, 65°E, about 830 km west of Mumbai, 570 km west-southwest of Veraval (Gujarat) and 800 km east-southeast of Muscat (Oman). The Joint Typhoon Warning Centre’s (JTWC) update on Tuesday afternoon stated that maximum sustained winds of ASHOBAA were around 93 km/hr gusting to around 120 km/hr. The India Meteorological Department (IMD), however, recorded maximum sustained winds of 60 to70 km/hr gusting to 80 km/hr and categorised ASHOBAA as a "cyclonic storm”. This difference in estimates is due to the different wind measurement techniques adopted by JTWC and IMD. At the moment, atmospheric and oceanic conditions appear to be favourable for a slow intensification of ASHOBAA till Wednesday, June 10. JTWC says it may even intensify into a Category 1 cyclone, but will then start weakening as it encounters unfavourable conditions. There is no threat to India as it will mostly move northwestwards towards the Sultanate of Oman. A landfall in Oman, forecast by the Global Forecast System (GFS) model, is expected to be quite a handful for the country. This model shows that rains and strong wind will commence in the eastern coastal areas of Oman from Wednesday morning. Muscat will also see rainfall and an increase in wind speed. Heavy rains and strong winds will be seen on Thursday, June 11, as ASHOBAA is anticipated to hit the coast of Oman near Sur with the strength of a tropical storm. At the time of landfall, maximum sustained winds will be around 80 to 90 km/hr, but wind gusts will be even more. The Arabian Sea will be very rough at beaches and other coastal areas. Similar conditions will prevail throughout Oman, including Muscat, on Thursday. Heavy rains will be capable of producing waterlogging and flooding in Oman Thursday onwards. Significant water logging can also be expected in Muscat as the city doesn’t have a proper drainage system. Even light to moderate thundershowers have brought widespread waterlogging to the city. After exiting the Arabian Sea, ASHOBAA will rapidly weaken and weather will gradually improve from the late hours of Friday, June 12. Weather will return to normal from Saturday, June 13. Here is how people of Oman can prepare for the rough weather. Store sufficient food, medicines, drinking water (at least three days of supply). Fill your car’s gas tank. Park vehicles like cars under solid shelters with the hand brake on and in gear. Bring in anything that can be picked up by the wind (bicycles, lawn furniture). Watch out for flying debris. Close your windows, doors and stay indoors (with your pets) as the cyclone approaches. Unplug electrical appliances before the cyclone strikes. Stay away from beaches, trees and power lines. Avoid travelling in such adverse weather conditions. Avoid flooded roads and damaged bridges. Obey orders given by the local official authority.